With the current state of the economy, having a well-defined target market is more important than ever. No one can afford to target everyone. Small businesses can effectively compete with large companies by targeting a niche market. Many businesses say they target "anyone interested in my services." Some may say they target small business owners, homeowners, or stay-at-home moms. All of these targets are too general. Targeting a specific market does not mean that you have to exclude people that do not fit your criteria from buying from you. 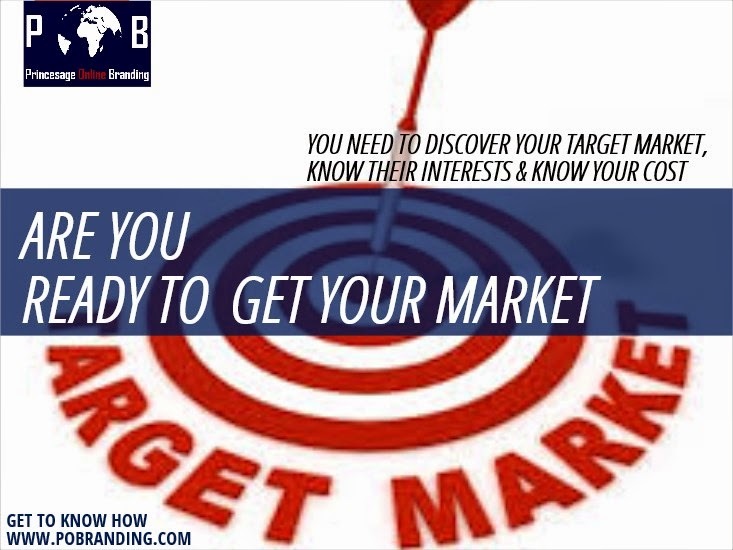 Rather, target marketing allows you to focus your marketing dollars and brand message on a specific market that is more likely to buy from you than other markets. This is a much more affordable, efficient, and effective way to reach potential clients and generate business. For example, an interior design company could choose to market to homeowners between the ages of 35-65 with incomes of N150,000+ in Lagos Island: VI, Banner Island etc market. To define the market even further, the company could choose to target only those interested in kitchen and bath remodeling and traditional styles. This market could be broken down into two niches: parents on the go and retiring baby boomers. Write out a list of each feature of your product or service. Next to each feature, list the benefits they provide (and the benefits of those benefits). For example, a graphic designer offers high quality design services. The resulting benefit is a professional company image. A professional image will attract more customers because they see the company as professional and trustworthy. So ultimately, the benefit of high quality design is to gain more customers and make more money. Determine how your product or service will fit into your target's lifestyle. How and when will they use the product? What features are most appealing to them? What media do they turn to for information? Do they read the newspaper, search online, or attend particular events? Don't break your target down too far! Remember, you can have more than one niche market. Consider if your marketing message should be different for each niche market. If you can reach both niches effectively with the same message, then maybe you have broken down your market too far. Also, if you find that there are only 50 people that fit all of your criteria, maybe you should reevaluate your target. The trick is to find that perfect balance. You may be asking, "How do I find all this information?" Try searching online for research others have done on your target. Search for magazine articles and blogs that talk about your target market or that talk to your target market. Search for blogs and forums where people in your target market communicate their opinions. Look for survey results, or consider conducting a survey of your own. Ask your current customers for feedback. Defining your target market is the hard part. Once you know who you are targeting, it is much easier to figure out which media you can use to reach them and what marketing messages will resonate with them. Instead of sending direct mail to everyone in your zipcode, you can send only to those who fit your criteria. Save money and get a better return on investment by defining your target audience.